Two years ago on this day, on the 17th December, the men 4x100m relay quartet of Yeo Foo Ee Gary, Muhammad Elfi Mustapa, Lee Cheng Wei, and Muhammad Amirudin Jamal set a new national mark with a sublime time of 39.82 seconds at the 2009 SEA Games, Laos. Going into the competition the unfancied Singapore team nearly stunned the favorite Thailand as they put up a strong fight right from the start till the finish. The Thai however having an overall better ground speed, pipped our boys for the gold medal by 48 hundredth of a second. The winning time was 39.34 seconds to the Thais, while second place Singapore team was clocked at 39.82 seconds in the finals. The relay boys successfully emulated the 2003 relay team performance in Vietnam which last won the 4x100m silver medal. 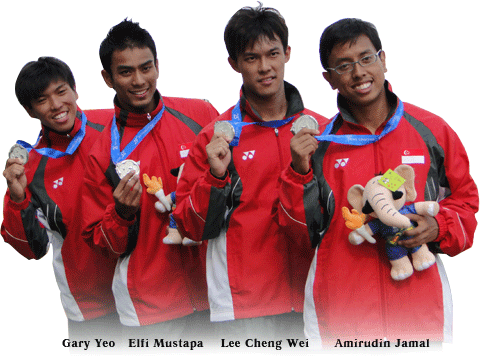 That team comprised of Lin Jingze, UK Shyam, Hamkah Afik and Poh Seng Song. Despite settling for silver our boys had another reason to rejoice as they’re the first Singapore squad to go below the 40 seconds barrier for the 4x100m relay event. Their 39.82 seconds timing in Vientiane, Laos improved and erased the old record of 40.10 set in 2007 at Korat, Thailand (Yeo Foo Ee Gary, Mohd Shameer Ayub, Kang Li Loong Calvin, & Poh Seng Song). The mark still stands today. Team Singapore in the outer most lane in red.